Boomerang Giving is pleased to be partnering with Gen2Gen Reads and First Book to help raise the funds to donate 1,000 new books to Head Start centers across the country. Boomerang Giving is a national movement of older Americans who are making our communities stronger by donating some or all of our senior discount savings to our favorite charities. We dare to imagine the collective impact we can have if we invest our senior discounts in our communities. Using the Boomerang Giving App on your smartphone makes it easy to put books into the hands of eager young readers! It’s as easy as 1·2·3! Install the app on your smartphone or tablet and create an account. Ask for your senior discount at the movie theater, restaurant, museum, grocery store, pharmacy and more. As you receive discounts, simply enter the amounts into the app. As your accumulated discounts add up, securely donate those savings to Gen2Gen Reads using your credit card. A receipt will be emailed to you for your records. Follow along in the app to see our collective progress, and be sure to share with your friends and family! The savings is the running total of your accumulated discounts. Once this reaches $20, you will be prompted to enter credit card information to send a donation to Gen2Gen Reads. 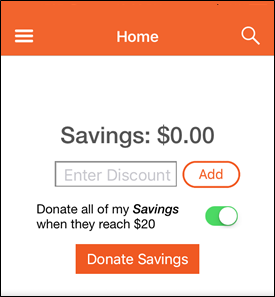 Alternatively, click “Donate Savings” at any time to send your donation. Enter senior discounts that you have received in the “enter discount” box. For example: a $3 discount at the movie theater. Senior discounts are a resource available only to older Americans – and the millions of dollars this resource represents have never been tapped for charitable purposes. Donating senior discounts enables many older Americans to experience the joy of giving. Although some seniors need their discounts, many do not and may not even take advantage of them. For these people, it is found money. Small discounts really do add up. $2 saved at a movie theater added to $1 saved on a bus ride adds up to $3 which enables Gen2Gen Reads to put one book into the hands of a young child! Boomerang Giving is an opportunity to pass values on to the next generation: Invite your children or grandchildren to take part in tracking discounts and counting how many books can be shared with others! By encouraging older adults to take advantage of senior discounts and actively redirect them to charity, Boomerang Giving empowers seniors and helps redefine a generation. and redirect the saved money to Gen2Gen Reads!